(FUSHIGI YUUGI) is an anime/manga series set in a world a bit like ancient China called the Universe of the Four Gods. 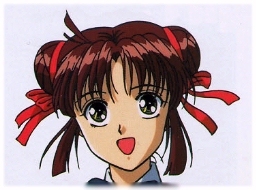 This page is a shrine to one of the main characters of the series, Yuuki Miaka, and is not intended to be any kind of general FY information page. To find out lots more than this humble page can possibly offer, try Chichiri's incredible Open Onto Infinity... page, or for lots of other FY stuff Thea's Suzaku no Webpage. Having gone through anipike and numerous other Fushigi Yuugi links, I found, much to my surprise that there were hardly any Miaka shrines. I find this extremely distressing; I know full well of some people's opinion of her but I think that with the massive following (mostly female I might add.. =P) of the various Seishi the poor Suzaku no Miko has been overlooked. (Btw, "Densetsu no Shojo" is what Hotohori's advisors first call Miaka; meaning "Girl of the legend"). There have been visits to this page. Of course, Miaka probably wouldn't last long without her Seishi, who each represent one constellation of Suzaku's quadrant in the night sky; the Red Bird of Summer. When she finds all seven Seishi, she is able to summon Suzaku and make any wish come true. Here are some links to some brilliant Fushigi Yuugi pages! I've collected a few good ones here, but if you want the complete selection your best choice is definitely Anipike, which has enough links for a lifetime of a busy otaku! Miaka-chan: Hoshi-chan, you need to make some new Suzaku icons for my page! Hoshi-chan: Ano? Ahh, Miaka, I'm busy with exams at the moment! So, you think you know your FY?